I now regret not reading the ingredients list more closely and not reading it all the way to the end. As a busy mom trying to get through the grocery store, I simply saw: sausage, pepperoni, and bacon. Good enough. Chuck it in the cart. It was that chipotle cheddar sauce, that inconspicuous final item on the ingredients list on the front of the box, that did my family in. If you like spicy foods, you’ll be just fine. My family mild to moderately spicy food, but this pizza was too much for us. We ALL (even the grownups) ended up throwing away our cooked pizza and scrounging in the fridge for leftovers on the night we baked this pizza for dinner. To be fair, if you love spicy food, this pizza will be right up your alley. 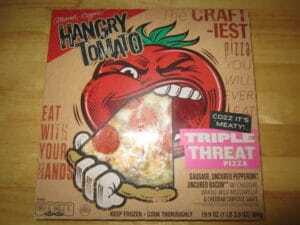 I’m not sure, but I now suspect most of the Hangry Tomato pizzas have some kick, which might explain their peppy name and snappy packaging illustrations. So, buyer beware. Or bon appetit. It depends on your preference. Spicy sauce aside, the rest of the ingredients — including the sausage, pepperoni, and bacon — were fantastic. The ingredients were flavorful and the toppings plentiful. Aldi’s Mama Cozzi’s Hangry Tomato pizza line seems to focus on spicy or otherwise kicky pizzas. If heat is your thing, these pizzas have good quality ingredients and nice flavor. However, if you can’t stand the heat, keep this one out of your kitchen.